Beginning Friday, Microsoft’s Outlook Web App integrates features that allow saving changes in documents attached to emails—all without the hassle of downloading the files, saving changes, and emailing them back. It’s all part of a strategy Microsoft outlined in March in the days before its BUILD conference kicked off. 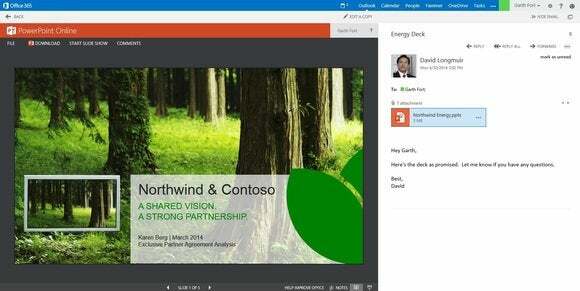 Although Microsoft has publicly revealed its roadmap for dedicated Office 365 apps in a bid to show customers what features they can expect, the Web Apps—often overlooked as pale shadows of the full Office 365 experience—are where Microsoft is quickly rolling out some of its most intriguing new features. Microsoft, for example, has rolled out a “clutter” tool in Android’s Outlook app to sweep away all those immaterial emails about office blood drives into their own folder. Today, if you email any Word, Excel, PowerPoint, or PDF file, as well as most types of images, Microsoft’s Outlook Web app will simply open the file next to the email message. Only Word, Excel, and PowerPoint files created in Microsoft Office 2007 and above can be edited. In either case, Outlook’s Web app now highlights those attachments with large, obvious icons, and—like many other email programs—downloads multiple attachments as a ZIP file. Choosing to edit a document saves a copy and allows you to make changes. Choosing to edit a document, however, does three things: First, it automatically opens a “Reply All” email for you to respond to. Second, it opens the attachment in PowerPoint, Word, or Excel, as an edited document with your name attached. Third, it keeps the original document for comparison. Note that Microsoft added true real-time collaboration to Office Web Apps last year, allowing coworkers to simply share a presentation or document, and make changes in real-time. Unfortunately, this “live typing” functionality hasn't made its way into the collaboration that Microsoft launched on Wednesday, according to a company spokeswoman. Other features will roll out later this year, she said. Presumably, that will include real-time collaboration as well.